The following are the latest results contributed by HM Courts Service, for cases sentenced by West Sussex Magistrates’ Court sitting at Worthing from October 5 to 11, 2018. Mark Neal, 50, of Ashurst Drive, Goring, was fined £1,000 and must pay £100 victim surcharge, £85 costs, after admitting driving over 70mph on the A27 Salthill Road, Chichester, on October 25, 2017. He was disqualified from driving for 21 days. Harry Ellett, 33, of Church Walk, East Worthing, was fined £200 and must pay £30 victim surcharge, £85 costs, after admitting assault by beating in Worthing on September 20, 2018. Stuart Reid, 49, of Balcombe Avenue, Worthing, was fined £250 and must pay £85 costs after admitting driver over the 30mph speed limit in Broadwater Road, Worthing, on October 13, 2017. He was also fined £250 and must pay £30 victim surcharge, £85 costs, after admitting driver over the 30mph speed limit in Broadwater Road, Worthing, on October 15, 2017. His driving record was endorsed with a total of six points. Carolyn Brice, 53, of Dalloway Road, Arundel, was fined £66 and must pay £30 victim surcharge, £85 costs, after admitting driving over 70mph on the A27 Shoreham bypass on December 16, 2017. Her driving record was endorsed with three points. 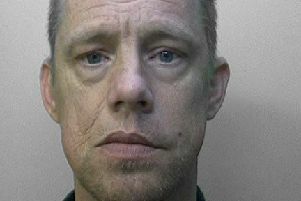 Michael Chappell, 30, of Seafield Road, Hove, was given a community order with Rehabilitation Activity Requirement and must carry out 150 hours’ unpaid work after admitting stalking without fear, alarm or distress, amounting to harassment through numerous messages and attending an address in East Preston between January 1, 2018, and September 12, 2018. He was also given a restraining order and must pay £100 compensation, £85 victim surcharge, £85 costs. He also admitted trespassing on the railway line at Angmering Railway Station on September 12, 2018, no separate penalty. Stephen Watson, 65, of Hammy Close, Shoreham, was given a 12-month prison sentence, suspended for 12 months, with eight-week curfew, electronically monitored, from 7pm to 7am daily, after being found guilty of driving dangerously in Hammy Close, Shoreham, on March 21, 2018. He must pay £115 victim surcharge, £620 costs, and was disqualified from driving for 15 months. He admitted driving without due care and attention in Hammy Close, Shoreham, on March 21, 2018, no separate penalty. James Phillips, 23, of West End Way, Lancing, admitted breaching a community order and was dealt with for the original offence, receiving a community order with six-month curfew, electronically monitored, from 9pm to 6am daily, for possessing pepper spray without authority in Lancing on May 4, 2017. He must pay £60 costs. Kieran Denver, 45, of Neville Road, Eastham, was fined £146 and must pay £30 victim surcharge, £85 costs, after admitting being drunk and disorderly in Chapel Road, Worthing, on September 21, 2018. He also admitted breaching a conditional discharge order, no action taken. Aaron Kingshott, 19, of Freshbrook Road, Lancing, was fined £126 and must pay £30 victim surcharge, £85 costs, after admitting drink-driving (49mg of alcohol in 100ml of breath) in Grinstead Lane, Lancing, on September 23, 2018. He was disqualified from driving for 14 months. Reiss Scott, 19, of Joyce Close, Wick, was fined £80 after admitting possessing cannabis in Littlehampton on September 17, 2018. He was fined £120 and must pay £30 victim surcharge, £85 costs, after admitting driving without insurance in Faulkner Gardens, Littlehampton, on September 17, 2018. He was disqualified from driving for 12 months. He was fined £40 after admitting driving without the correct licence in Faulkner Gardens, Littlehampton, on September 17, 2018. Alexander Wilson, 41, of Lyndhurst Road, Worthing, was given a 12-week prison sentence, suspended for 12 months, after admitting stealing a selection of meat and washing tablets worth £68.23 from Tesco Express, Worthing, on September 9, 2018. He was given a four-week concurrent prison sentence, suspended for 12 months, after admitting common assault at Tesco Express, South Farm Road, Worthing, on September 9, 2018. He was given a 12-week concurrent prison sentence, suspended for 12 months, after admitting stealing meat and alcohol worth £303.46 from Sainsbury’s on September 22, 2018. He must pay £25 compensation for the assault, £115 victim surcharge, £85 costs. Robyn Stroud, 21, of Chantryfield Road, Angmering, was fined £250 and must pay £30 victim surcharge, £85 costs, after admitting drug-driving (7.0ug/l Delta-9-THC) in Lyminster Road, Arundel, on April 29, 2018. She was disqualified from driving for 12 months. She also admitted driving without insurance, no separate penalty.